Turkish marshmallow & caramel filled biscuits from Ülker: in this case, the product is far better than the packaging and the branding. Delicious, crumbly moist biscuits, not to sweet, with a thin layer of caramel between it and a fluffy white marshmallow filling, all of it covered in chocolate (decent quality chocolate). I bought this package from the supermarket, yesterday, just because i had a nostalgic feel about it. It is a rare brand of biscuits on the shelves of German discounters, I can tell you that. I am familiar with this brand, from Romania, because since the 90’s, Ülker was a heavy player, competing with local brands, offering many childhood treats among other Turkish imported sweets, brands like Bonbibon (a Turkish placebo-product for Smarties), Biscrem and Topitop (the Turkish version of Chupa Chups). During the 90’s, the Romanian market was flooded with Turkish goods, from blue jeans and colorful T-shirts to soda drinks and sweets, just at the dawn of free commerce and capitalism, after the tumultuous collapse of communism. To my surprise, yesterday, when I saw this package again, after more than 10 years, I came to the conclusion that since then, there wasn’t much improvement, regarding package design and branding. 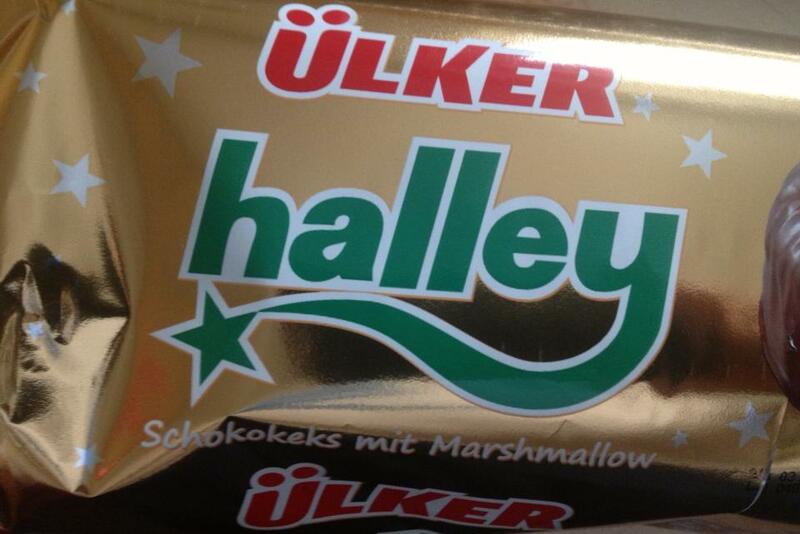 First of all, this sub-brand “Halley” could have a better logo, instead of a poorly rendered type mark and most definitely, the packaging can be a lot more refined. A brand needs to have “clothes” tailored to its needs and objectives. In a highly competitive world, a good packaging and suitable branding will always persuade a customer. The price is definitely a factor of influence, but most likely the visual experience will have the most decisive effect, if the prospect has no clue about the product and in the same price range, he has multiple choices. Ülker needs to step it’s game up, in this case, because it has a lot of room for improvement and a good product. All rights reserved. Individual works © Narcis Lupou and / or the respective copyright holders. No part of this publication may be reproduced or transmitted in any form or by any means without permission in writing from the copyright holder.